Boston Takes The Field, While The Yankees Break Out "Sweet Caroline"
Even after the most routine, stressful workday, it's nice to come home and watch a baseball game and forget about everything else for a few hours. 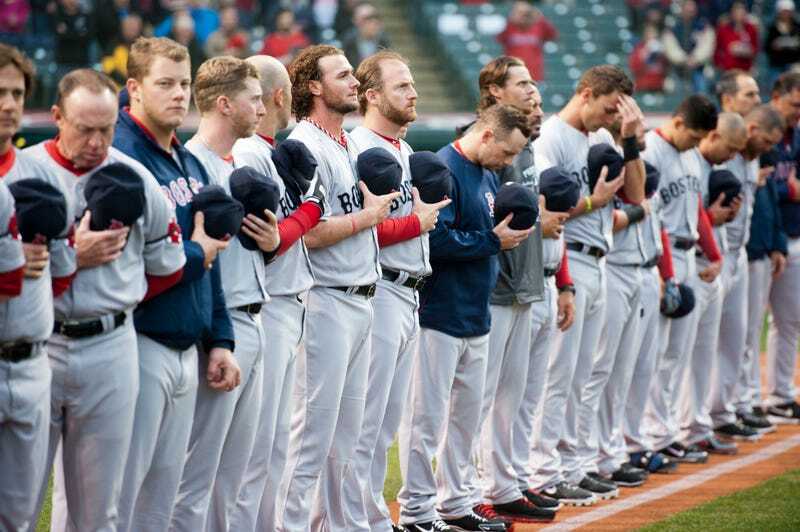 Last night, for the first time since Monday's marathon bombings, the people of Boston had the Red Sox. On another day we'd be talking about Terry Francona's first game against his old team after an acrimonious divorce. Or about the Indians' remarkable attendance woes—9,143 last night. Or even about the Red Sox's 7-2 win, thanks to a seven-run second inning capped off by Mike Napoli's bases-loaded double. But instead it's about Boston. Will Middlebrooks has been ending his Tweets with #BostonStrong, and it's become something of a rallying cry. So before the game, clubhouse manager whipped up a special jersey, Boston Strong, with the 617 for the Hub's area code, to hang in the dugout. “Just something to let the people know,” Johnny Gomes said. “They’re out of sight right now, but definitely not out of mind. How far is that jersey going to stretch? I don’t know. Just the fact of letting those people know we’ve got a heavy heart over here. The TV in the clubhouse wasn't tuned to the usual ESPN, and the players weren't watching much video on opposing starter Ubaldo Jimenez. It was all CNN, all the time. Maybe three hours of baseball wasn't a welcome distraction for just the fans.